Since our definitions of respectful behavior vary, we need to sharpen the skills of talking constructively with each other to learn more. 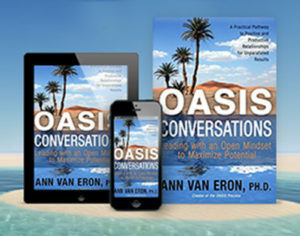 OASIS Conversations will support you in promoting more respect. I often work with teams to have OASIS Conversations about what they need to feel respected. In one company, a manager said she wanted people to walk into her office at the scheduled meeting time. This supported her in closing the meeting she was finishing and staying on time. Another manager in the same office found it more respectful for staff to wait outside his office even if he were running late. Another person said she would feel more respected if people did not “borrow” staplers and tape off of her desk without asking her. Someone else asked that people not speak to her as they approached her desk. Often, she was occupied and speaking on a phone headset. People were not aware of it since her long hair hid the phone. Another person experienced respect when her peers in the office pitched in and helped her finish a project at the end of the day. People who spend time together need to have conversations about what is important to them as signs of respect. A periodic review of how people are doing in supporting some of these behaviors will prove useful, too. One work team in a hospital had been given the organization’s lowest customer service score. The team members met and agreed on eight actions they could take to support more respect among their group. For example, they agreed to call each other by their first names and to greet people by name. They also agreed to walk clients to their next appointment. Within a year, this team had moved from the lowest to the highest rating and received an award for its customer service responsiveness! The actions the team members took were simple and cost the organization very little. All staff reported feeling better about coming to work and felt more valued. Morale, motivation, and employee engagement were significantly enhanced. What improved the situation was an OASIS Conversation and agreement among the team members on solutions. It is important to recognize how the environment you create with others directly influences results. In a negative or disrespectful environment, less energy and attention are available for creativity and using team diversity to create positive results. Research reported in the December 2013 Harvard Business Review supports that the best solutions come from cohesive teams with diverse backgrounds and perspectives. Creating a positive environment is critical for success, and the OASIS Conversation process will help you to create a respectful environment. Before we close this chapter, here are some practices for you to work on to become more respectful. Pay attention to what you identify as respectful behavior. Keep a list and then notice how your background experiences and conditioning influence you to identify, for example, holding doors open for others as respectful. Talk with people in your family, community, workplace, or school and listen to what each one identifies as respectful behavior. List items on a chart and agree on those you will try to emphasize. Later, come back and ask people how they are experiencing respect. Talk about what else is needed to support an environment of respect and trust. Pay attention to the people in your home, workplace, and community. Do you sense they feel valued and respected by you? What do you notice? Which relationships could benefit from an OASIS Conversation to identify how to support an experience of respect? This entry was posted in Communication by Ann Van Eron. Bookmark the permalink.